All our subwoofers feature our Direct Servo technology, which is our secret to achieving tight and accurate bass. The benefits are far more than simply achieving low distortion. 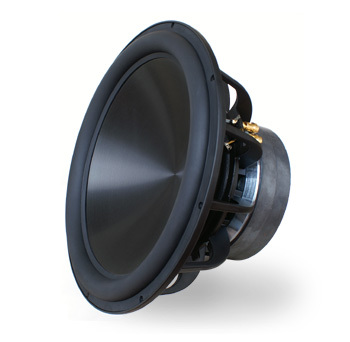 Compared to our standard range of drivers, our DS1510 has a 3" voice coil which has a high thermal power handling and features lower power compression. While designed primarily for their sound quality, these custom designed drivers are also stylish in appearance with a anodized aluminum cone and rubber surround. Unfortunately, it's not possible to judge the accuracy of a driver by observing its appearance. There are other drivers on the market which in fact look quite similar, and it's tempting to think that they are comparable. Many of them are inferior in performance due to a heavy moving mass, the absence of shorting rings, wider gaps around the voice coil and high inductance which limits the useable high frequency cut off point. Many aren't suitable for a crossover point higher than 50 Hz. This is very limiting when one considers the large number of home theatre speakers which perform better when relieved of bass duties. Our enclosures are very solid and well braced to minimize any cabinet resonances or coloration. The baffle into which the driver is mounted is double thickness. We also provide a range of finishes. All of our subwoofers feature unique bass extension controls which are not normally provided on subwoofers. This enables the user to customize the output and extension to achieve the best compromise in any room. Most subwoofers neglect to provide bass extension control, and the result is that dynamic headroom is compromised. The bass extension controls enable the user to customize the frequency response of the low end. The controls customize a high pass filter, which attenuates frequencies below a given frequency. If set to 14 Hz, bass below this point will be filtered. The damping control determines the slope of roll-off and the amount of time domain ringing. High damping provides the least amount of time domain ringing and the most gradual roll-off curve. Low damping provides the steepest roll-off at the low end at the expense of added time domain ringing. The combination of 28hz and low damping is recommended for maximum SPL ouptut for all of our sealed subwoofers. To suit different setups, we provide a 12 db and 24 db/octave crossover. If you are using an AVR, then we recommend "AVR/12" (or EXT/12 in older amps). If you are still using stereo receiver or conventional pre/power amp setup, then we recommend the 80hz/24 db/octave setting. To understand more about how to correctly integrate your subwoofer, read our phase alignment article. Note: the 24db/octave crossover option is only available on our PEQ and XLR versions. The standard version only has a 12 db/octave crossover. For professional use, a balanced input version is available. 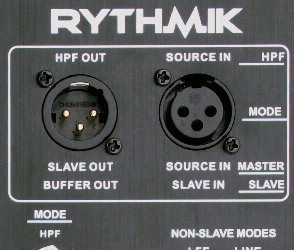 The outputs allow multiple subwoofers to be connected. Simply daisy chain the connections, running output from the first (master) subwoofer to the input of the next. For home use, balanced connections are not normally required. However, for those using studio processors and EQ units with balanced outputs, this option may be more convenient. If connection to a source with RCA connectors as found on my home audio equipment, an adaptor may be used. In this case it should be noted that the connection can no longer be considered balanced. Shown above is XLR2 opton. 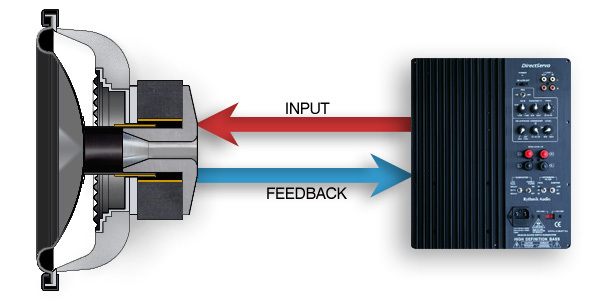 Slave subwoofer units each have their own phase and PEQ adjustment, allowing for placement apart from each other. All other controls will use the same settings as the master sub. Therefore you can adjust the gain on the first and it will control the gain on all the others. The servo will still function normally, correcting any non linearities in each individual subwoofer. We also have XLR3 options with two XLR inputs and no XLR output. Our PEQ version comes with a few extra options which aren't provided on our standard amplifier. First, there is one band of parametric EQ with adjustable frequency, gain and bandwidth. This means you can not only control the boost or cut, but also the width of the filter. Additional bass management options are also provided. 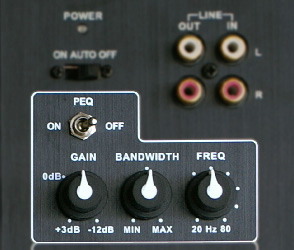 A switch allows the user to select a 12 or 24 db/octave crossover slope setup option. Where the higher slope (24db/octave) is selected, the amplifier uses a variable 12db/octave filter in addition to a fixed 12db/octave filter. One can choose with a switch the corner frequency of the fixed filter as either 50 or 80 Hz, which will suit most situations. The variable filter can be used for fine tuning.